This photograph was taken at the entrance to the Motherwell Town Hall, prior to the Ceremony, and is reproduced from an article in the " Hamilton Herald " newspaper dated 14th June 1901. This photograph shows the Ceremony in progress, note the consecration vessels. The cross structure is a simple crane, used to lower the actual stone which is immediately to the left of the Union Flag, and at the S-E corner of the first floor. The ceremony raised much local interest and the following report is reproduced from The Motherwell Times, Friday 14th. June 1901. The Memorial Stone of the new Masonic Halls in Hope Street was laid on Saturday last in beautiful weather, by Brother Colonel R.K. Stewart of Murdostoun Castle, Provincial Grand Master of the Middle Ward of Lanarkshire. The ceremony was made the occasion of a brilliant Masonic demonstration, there being a large gathering of Brethren from the town and district in full Masonic costume. Ably assisting the Provincial Grand Master were Brothers Colonel J. Cunningham Kay S.P.G.M., Baillie H. Dyer P.G.S.W., W.Sneddon P.G.J.W., Baillie W.T.Hay Provincial Secretary, Baillie A. King Provincial Treasurer. The procession which was marshalled at the Town Hall by Brother W. McKean, Provincial Grand Marshal, and which was the largest Masonic gathering ever seen in Motherwell, marched by the way of Clyde Street, Merry Street, Dalziel Street, Coursington Street, Park Street, Crosshill Street, Brandon Street and Muir Street to the Halls in Hope Street. The procession which was accompanied by Coltness Iron Works Band was witnessed by large crowds all along the route. When the front of the procession arrived at the building the ranks opened up to allow the Provincial Grand Officials to pass through, and to take up their position near the stone. The musical part of the ceremony was rendered by Brother Burness’s choir, under Brother Thomas Dixon, Brother Burness officiating at the organ. The choir was accommodated on the building convenient to the place where the ceremony was to be performed. An interesting ceremony was brought to a close by other three cheers and the singing of "Rule Britannia" by the choir. The procession was then reformed and proceeded by way of Muir Street, to Milton Street, Calder Street, and Merry Street to the Town Hall where a banquet was held, and cake and wine served to the visiting Brethren. Brother John Frood I.P.M. 573 presided at the banquet, and proposed the toast of "The King and Craft" and "Grand Lodge". The following other toasts were duly pledged:- "The Provincial Grand Lodge of the Middle Ward of Lanarkshire" proposed by Brother Falconer, P.M. G.L.I.G., reply by Brother Colonel R.K.Stewart R.W.P.G.M. ; "Visiting Brethren" proposed by Brother Baillie Dyer. P.S.W., reply by Brother Smith R.W.M. 471; "Architect" proposed by Brother McKean I.P.M. 406, reply by Brother Cowan I.A., P.M. No.3 bis; "Local Lodges" proposed by R.W.Provincial Grand Master, reply by Brother Black R.W.M. 406 and Brother Campbell R.W.M. 573; "Town and Trade" proposed by Brother Baillie Hay, Provincial Secretary, reply by Brother Baillie King, Provincial Treasurer. Article reproduced from the " Hamilton Herald " dated 14th June 1901. 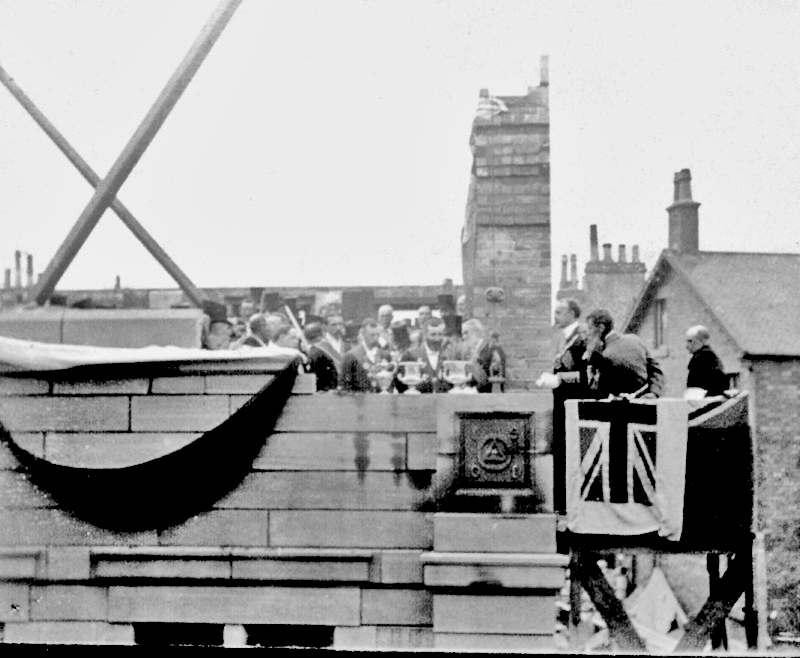 The ceremony of laying the memorial stone of the new hall which is at present being erected in Hope Street, by the two local Lodges of Freemasons, namely - Lodge St. John Dalzell, No. 406, and Lodge Livingstone St. Andrew No. 573 - took place on Saturday last under circumstances of the most favourable description. The procession of representatives from various Masonic Lodges in the west of Scotland, which took place through the principal streets of the Burgh prior to the ceremony, proved one of the largest and most interesting spectacles of the kind that has been witnessed in Motherwell for many a day, while the function itself was one of exceptional brilliance and impressiveness. The interesting proceedings commenced at three o'clock in the afternoon, when the Provincial Grand Lodge met in the Lesser Town Hall and formally received the deputations from Sister Provincial Grand Lodges. 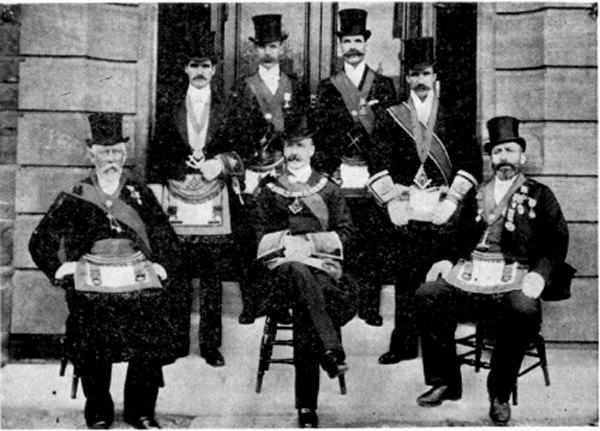 Half an hour later the various Masonic Lodges represented assembled in front of the Town Hall, where they were arranged in processional order according to the custom by the Provincial Grand Marshall, Brother William McKean, Motherwell, who performed his somewhat difficult duty with singular skill and success. On being marshalled the procession proceeded from the hall along Clyde Street, through the Cross, down Merry Street, along Dalziel Street, Coursington Street, Park Street, Crosshill Street, Brandon Street, and Muir Street to the site of the new hall in Hope Street. All along the line of march the streets were crowded on both sides with spectators who watched the proceedings with an intelligent interest. On the arrival of the procession at the Cross, the ordinary Lodges halted and took open order, so that the office-bearers and members of the Provincial Grand Lodge passed through the ranks to the scene of the ceremony, being followed by the other Lodges in their order of seniority. At the hall a platform of considerable extent had been erected for the accommodation of the Brethren. The first of the Masonic procession to walk up to the platform was the Provincial Grand Architect ( Brother John Young,Coatbridge) who was followed by the other Office-bearers of the Provincial Grand Lodge in the following order:- the Reverend Brother Andrew Robertson ( Hamilton ), Chaplain; Brother John Laurie ( Coatbridge ), Jeweller; Brother Henry Strickland ( Coatbridge ), Senior Deacon; Brother James Smith ( Coatbridge ), Junior Deacon; Baillie Brother Archibald King ( Motherwell), Treasurer; Brother W. T. Hay ( Hamilton ), Secretary; Baillie Brother Henry Dyer ( Motherwell ), Senior Warden; and Brother W.W. Sneddon ( Coatbridge ), Junior Warden. Then came the Provincial Grand Master Brother Colonel R. K. Stewart, of Murdostoun Castle, Newmains, who took up his position at the table, supported on the right hand by the Substitute Grand Master, Brother Colonel J. C. Kay ( Hamilton ). The remainder of the Grand Masters and Brethren followed in order and took up their position on the platform. A portion of the platform near the table was occupied by Brother J. Burness's choir ( Dalziel Parish Church ) which was under the leadership of Brother Thomas Dixon ( Coatbridge ), Provincial Grand Organist, while Brother J. Burness presided at the organ. The Provincial Grand Jewels, etc. having been laid on the Grand Master's table, the ceremony commenced with the proclamation of silence by the Provincial Grand Director of Ceremonies, Brother James Ramsay ( Airdrie ), after which " The King's Anthem" was sung by the choir. Brother Frood IPM, having, in his capacity as Chairman of the Building Committee, formally asked the Provincial Grand Master to proceed with the ceremony of laying the stone, Brother Cowan, the architect, presented Colonel Stewart with a trowel to perform the ceremony. After the rendering of the 100th Psalm by the choir, a prayer was offered up by the Provincial Grand Chaplain, the Reverend A. Robertson, and then Colonel Stewart called upon the Provincial Grand Secretary and Treasurer ( Messrs Hay and King ) to place the coins and other mementoes in the cavities of the stone, and the architect to bring forward the necessary workmen. On this being done the choir sang "The Church's one foundation", and during the music three distinct stops were made in lowering the stone. Thereafter the Provincial Grand Master walked from the platform to the East of the memorial stone, with the Substitute P.G. Master on his right, while the P.G. Wardens ( Dyer and Sneddon ) took up a position to the West of the stone with the level and the plumb. Everything being in readiness, the Provincial Grand Master said - " Right Worshipful Substitute Grand Master you will cause the various implements to be applied to the stone that it may be laid in its bed according to the rules of Masonry". The Substitute P.G. Master having ordered the Wardens to do their duty, the Provincial Grand Master said - " Right Worshipful Junior Provincial Grand Warden, what is the proper jewel of your office?" " The plumb " - " Have you applied the plumb to the several edges of the stone?" - " I have, Right Worshipful Provincial Grand Master " - " Right Worshipful Senior Provincial Grand Warden, what is the proper jewel of your office?" - " The level " - " Have you applied the level to the top of the stone?" - " I have Right Worshipful Provincial Grand Master". - " Right Worshipful Substitute Provincial Grand Master, what is the proper jewel of your office?" - " The square" - " Have you applied the square to those parts of the stone that are square?" - " I have Right Worshipful Provincial Grand Master". Thereafter the Provincial Grand Master said - " Having my Right Worshipful Brethren, full confidence in your skill in our Royal Art, it remains with me now to finish this our work". Colonel Stewart then gave the stone three knocks saying - " May the Almighty Architect of the Universe look down with benignity upon our present undertaking, and the edifice of which we have now laid the foundation, with every success". The completion of the ceremony was signalised by three hearty cheers from all the Brethren present. The choir afterwards gave a fine rendering of Handel's Hallelujah Chorus, and during the music a cornucopia was delivered to the Substitute Provincial Grand Master, a vase with wine to the Senior Provincial Grand Warden, and a vase with oil to the Junior Provincial Grand Warden. At the close of the "Chorus" the cornucopia was handed by the Substitute Provincial Grand Master to the Provincial Grand Master, who strewed its contents upon the stone. The vase with wine was then handed to the Provincial Grand Substitute, and was delivered by him to Colonel Stewart, who poured its contents upon the stone, and the oil in the same manner, saying -" Praise be to the Lord Immortal and Eternal, who formed the Heavens, laid the foundations of the Earth, and extended the waters beyond it, who supports the pillars of nations, and maintains in order and harmony, surrounding worlds. We implore Thy aid, and may the Almighty Ruler of Events deign to direct the hand of our gracious Sovereign, so that he may pour down blessings upon his people; and may his people living under sage laws in a free government, ever feel grateful for the blessings they enjoy". The Lodge of Glasgow St. John No. 3bis - Hamilton Kilwinning No. 7 - St. Mary, Coltness No. 31 - New Monkland Montrose No. 88 - Cambuslang Royal Arch No. 114 - Airdrie St. John No. 166 - Old Monkland St. James No. 177 - The Operative Lodge of Airdrie No. 203 - St. Andrew No. 215 - Hamilton No. 233 - Woodhall St. John's No. 305 - St. Thomas, Larkhall No. 306 - St. Clair No. 427 - St. John, Shotts No. 471 - St. Andrew, Coatbridge No. 544 - Clydesdale, Larkhall No. 551 - Clydesdale (Glasgow) No. 556 - Blantyre Kilwinning No.557 - Livingstone, Stonefield No. 599. On Saturday afternoon, in glorious weather and amid pomp and pageantry, the memorial stone of the new Masonic Hall which is being erected jointly by the two local lodges, St. John Dalzell No. 406 and Livingstone St. Andrew No.573, was laid by Brother Colonel R.K.Stewart, Provincial Grand Master of the Middle Ward of Lanarkshire. The Lodges met in the Town Hall, and accompanied by three brass bands marched through the principal streets of the town, attracting much attention en route. On arriving in Hope Street, the various junior lodges formed open order, and permitted the Provincial Grand Office-bearers to pass through to a platform within the building. The Grand Master having been presented with an ivory handled silver trowel and a mallet, the ceremony commenced, and ended with the singing of "Rule Britannia". The musical part of the ceremonial was rendered by Brother Burness's choir, conducted by Brother Dixon, and Brother Burness at the organ. At the conclusion of the ceremony, the procession was reformed, and marched to the Town Hall, where the visiting lodges were served with cake and wine. Councillor Brother Frood presided, and a toast list was gone through. The Halls, which are to be three storeys in height, are from plans by Brother J.L. Cowan, architect, Glasgow, and are to cost £ 3,500. After eighteen months of construction the Halls were completed and ready for their intended purpose. Along with the Architects drawing shown, the following report appeared in the Motherwell Times, Friday March 21st, 1902. 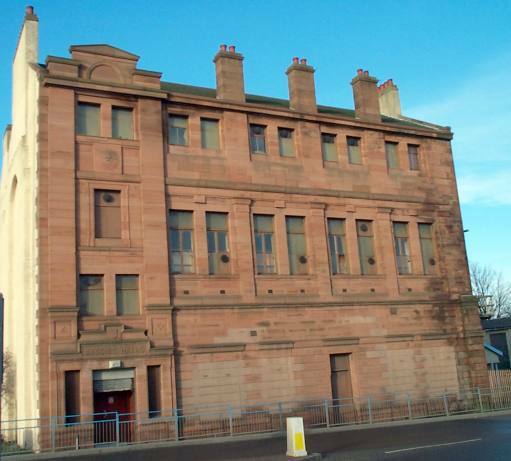 On Tuesday evening the new Masonic Halls, Hope Street, were opened and consecrated by Brother R.K. Stewart of Murdostoun, Right Worshipful Provincial Grand Master of the Middle Ward of Lanarkshire, and the Office Bearers of the Lodge. There was a large attendance of the Brethren of the local Lodges and deputation’s from all the Lodges of the Middle Ward of Lanarkshire, and also from other Lodges. The consecration took place at seven p.m. in the Lodge Room, Brother R. King Stewart in the chair, supported by Reverend Brother A. Robertson, Hamilton, Provincial Grand Chaplain; Brother Colonel J.C. Kay, P.G.D.M. ; Brother William McMurdo, P.M. 305 P.P.G.J. W., and other Provincial Grand Lodge Brethren. After prayer, etc. by Provincial Grand Chaplain, Brother Stewart called upon Brother McMurdo to give the oration, which was delivered in an excellent manner which proved to the Brethren present that their old and much respected Brother was still as fit as ever to pour forth the true principles of Freemasonry. After the sacred and solemn music had been sung by the choir and the Brethren, Brother Stewart proceeded with the consecrating of the Lodge room with corn, wine, and oil, which part was carried out by him and his Wardens in very able and effective manner. Thereafter the P. G. Chaplain gave the closing prayer, and the Lodge was closed in due and ancient form. This now brought the ceremony to a close by the Brethren singing the Hundredth Psalm, and they were assisted by the Provincial Grand Organist, Brother Thomas Dixon, Coatbridge, who presided at the organ.Immediately after the above, the Brethren met in the large hall, and about 300 sat down to tea which was purveyed by Brother T. Robertson in an excellent style. Brother Frood, I.P.M. 573, chairman of the building committee presided. After tea the following toast list was gone through:-"King and Craft" proposed by the chairman; "Grand Lodges",proposed by Brother H. Dyer, P.G.S.W., and replied to by Brother R. King Stewart; "Provincial Grand Lodge of the Middle Ward of Lanarkshire" proposed by Brother Black I.P.M. 406 and replied to by Brother Colonel Spence P.G.L. ; "Visiting Brethren" proposed by Brother R. Campbell, R.W.M. 573 replied to by Brother Walker R.W.M., 203 and Brother Stronach, R.W.M. 579; "Local Lodges", proposed by Brother Walker, R.W.M. 203, and replied to by Brother Borland R.W.M. 406 and Brother Campbell, R.W.M. 573; "Architects and Contractors" proposed by Brother Frood I.P.M. 573, and replied to by Brother J.L. Cowan P.M. 3 bis., and Brother Miller 406; "Building Committee" proposed by Brother Cowan and replied to by Brother McKean P.M. 406. Brother H. Dyer in an able manner, proposed a vote of thanks to the chairman, which was heartily given, and Brother Frood thanked the stewards on behalf of the Brethren for the efficient way they had discharged their duties. Songs were rendered by Brothers Moore, Foulds, Mason, Christie and MacLean, and musical selections by the Grant family, Airdrie, were very much appreciated. Brothers Dixon and Burness presided at the piano. 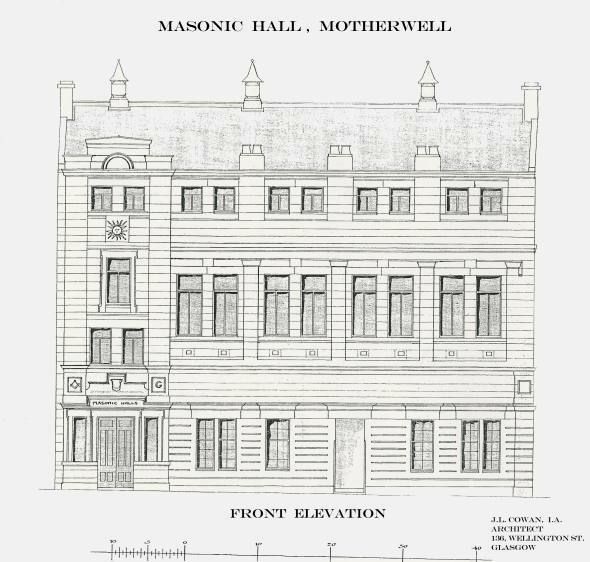 The building Committee are to be congratulated on the success of the opening of their new halls, as it will long be remembered by the Brethren of Motherwell as one of the most important and successful events ever held.The new Masonic Halls, which are situated in Hope Street, which like many of our finest buildings are situated off the main thoroughfare, are very conveniently situated near the railway station.The halls have been erected by the two Lodges here, namely, "Lodge Livingstone St. Andrew, No.573" and "Lodge St. John DaIzell No.406".On the ground floor the entrance hall is large and spacious, with floor laid with terrazzo, and tiled around the wall. Adjoining this is a large reading room. As you proceed up the tiled staircase on the first flat you enter the large banquet hall which is splendidly fitted up for socials, marriage parties or dances, with gallery and artistes rooms; also a kitchen conveniently situated for bakers, and purveyors. On the second flat we come to the janitor’s house and the entrance to the gallery. On the top flat there is the Lodge Room fitted and finished with every modern convenience, adjoining this there is a smaller hall and ante-room for friendly societies of all kinds. The latest improvements have been secured for the lavatories, and the whole building has been fitted up with electric light. The following are the names of the contractors who have carried throughout he work, under the supervision of Brother J.L. Cowan I.A., Glasgow— Mason, Alexander Sym; Joiner, Thomas Miller; Plasterer, James Craig; Plumber, John Alston; Painter, A. Kemp; Slater, James Thompson; Tiles, Haddow & Co, Glasgow; Heating, Hamilton & Co.; Electric light, Reid & Co.Both Lodges are to be congratulated on the completion of their efforts to provide suitable quarters for their meetings and not a little of the success of the undertaking is due to Brother J.Black of Lodge St. John Dalzell and Brother J. Frood of Lodge Livingstone St. Andrew on whom the bulk of the labour and responsibility of the last twelve or eighteen months, and to these gentlemen it must be a source of satisfaction to see such a successful end to their labours. The Halls, we understand, are now available for use, and any information regarding them may be had from the secretary, Brother John Black, 70 1/2 Merry Street, Motherwell. This original Architect's drawing was scanned, and enhanced by Brother Ian Gray.